Home » Coast to coast » Women, yes! Corporations, no! 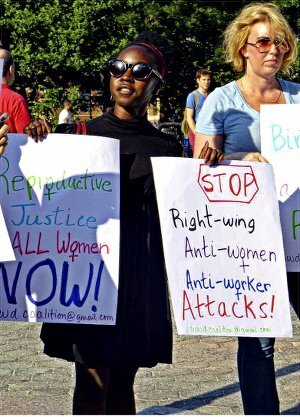 The International Working Women’s Day Coalition held an after-work protest in Union Square on June 30. The group denounced the Supreme Court’s 5-4 decision giving for-profit corporations the right, based on “religious liberty,” to limit the contraceptives their employees could select under the Affordable Care Act. Granting religious rights to corporations is a precedent-setting decision, which could discriminate against thousands of poor working women.